Early applications of telemedicine involved medical personnel in one location connecting with medical personnel in another to confer on a case. 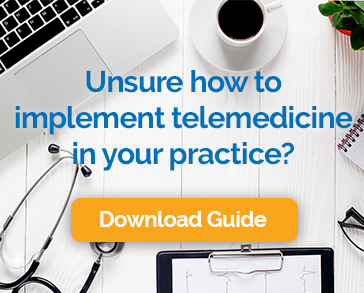 With the introduction of the internet and modern computing devices, the number of ways in which telemedicine can be used to care for patients has increased astronomically. Telemedicine now has the potential to impact how patients interact with providers across the entire healthcare landscape. Using secure, high-definition audio and video to connect patients and providers at a distance has big advantages for both patients who are in the hospital and those who aren’t. Here’s a look at how telemedicine is used in each situation. There are some important ways that remote patient care can be used to improve outcomes for patients who are in the hospital. In some places, there are general physician shortages or a serious lack of nearby specialists. Telemedicine expands the geographical reach of every resource, getting the right care to more people. For example, the hospital on the island of Nantucket is staffed exclusively with primary care physicians. If a specialist is needed, doctors there can establish a remote connection with the right provider on the mainland. This reduces the expense of moving patients to providers or bringing providers to patients. The post-hospitalization period is a critical time to monitor patients with the hope of reducing the chance of readmission. Telemedicine, including follow-up visits and remote patient monitoring, has been proven to have a significant impact on hospital readmissions. In fact, when the Veterans Health Administration implemented telemedicine for past heart attack patients, hospital readmissions due to heart failure dropped by 51%. A study on the Geisinger Health Plan backed this up, showing that telemedicine reduced 30-day hospital readmissions by as much as 44%. Another way that telemedicine can be used for people in the hospital is to expand the services that they are able to receive. For example, people who will benefit from mental health services following discharge can begin receiving those services will still in the hospital, even if the hospital does not have those resources on staff. Although telemedicine became widespread in inpatient settings first, it has now escaped into the rest of the world. (In a good way.) Because most people now have access to high-speed internet and devices with high definition cameras, telehealth can be practiced from virtually anywhere, and it is. Remote follow-up visits are an excellent example of how video visits can provide benefits to patients and practices alike. They eliminate all of the inconvenience of going into a medical office like travel time and missed time at work. They make it easier to comply with the physician’s follow-up instructions and help keep patients engaged in their care. For providers, remote follow-up visits reduce last minute cancellations and no-shows. They improve patient outcomes, and they make office staffs more efficient. Whether a laboratory test or diagnostic imaging study comes back within normal range or out of it, it is important for providers to share the results and have a conversation about what they mean if necessary. Before telemedicine, many providers did this over the phone which sometimes hurt communication effectiveness, and almost always meant that the encounter would not be reimbursed. Now a video encounter can be used to make sure that the patient understands this important information. As an added benefit, in many cases, these visits now become reimbursable to the provider. The number of people with chronic conditions in the United States is large and rapidly growing. Getting quality care for these patients can put a big burden on the person with the condition and the provider alike. Telemedicine eases some of this load, making it easy for providers and patients to connect without logging miles driving back and forth to the office. One major goal of the entire healthcare system is to keep people out of the emergency room when it isn’t necessary for them to be there. In some cases, it is obvious that a patient needs to be seen immediately in a fully equipped setting. In other situations, it can be difficult for the patient to know if that’s the best course of action. Telemedicine can be used to triage some of these cases and provide care to patients with less serious conditions. You might have noticed a theme between the uses of telemedicine inside the hospital and out. In both cases, the result is more efficient use of resources, improved patient outcomes, and a wider range of available services. That’s good news across the board.